Washington’s unusually cold and wet winter continued this week, with heavy snowfall along Interstate 90 in Central Washington and at Snoqualmie pass. Weather conditions contributed to several crashes along the highway this week, including one fatality. On Tuesday, a large snow storm hit the area near Cle Elum. Heavy precipitation combined with low temperatures caused a significant buildup of ice on the busy highway. A winter storm warning remained in effect until 6 am on Wednesday, with another 6 to 12 inches of snow predicted at Snoqualmie Pass. Meteorologists are currently predicting that a further 6 to 10 inches of snow will fall on the pass between Wednesday afternoon and Wednesday evening. Further snow is expected throughout the rest of the week. According to Washington State Patrol Trooper Brian Moore, a semi-truck rolled over and landed on top of a pickup truck on Interstate 90. This crash occurred near Cle Elum. According to Trooper Moore, the pickup truck’s driver lost control of the vehicle and spotted the semi-truck driver losing control as well. Multiple occupants of the pickup truck were able to escape their vehicle and run up a hill before the semi-truck fell over, crushing their vehicle. A 63-year-old woman died when her pickup veered off the highway, hit a guardrail, and rolled over. Her two passengers, a 21-year-old-man and a 21-year-old woman, sustained serious injuries and were transported to a hospital. One of the injured victims was reported to be in critical condition. This crash happened east of Cle Elum. The woman who died was a professor at Central Washington University’s College of Education and Professional Studies. The university’s president is expected to put out a statement later today. According to the Washington State Patrol, the cause of the crash was speeding too fast for conditions. They do not plan to file charges. In the westbound lanes of Interstate 90 near Elk Heights, a semi-truck veered off the road and into a ditch. Minor injuries were reported in this collision. Trooper Moore also tweeted a video showing an ambulance that had rolled over onto its side. No serious injuries were reported in this crash. The ambulance had been transferring a pediatric patient to a hospital in Seattle. On Tuesday, troopers shut down Snoqualmie Pass at 5:00 pm, after closing the eastbound lanes earlier in the day. Approximately 9 inches of snow fell on the pass between 8 am and 4 pm on Tuesday. Snowfall was so heavy that authorities were concerned about the possibility of avalanches. The pass was reopened close to midnight, but only all-wheel drive vehicles and vehicles with chains are allowed over the pass. 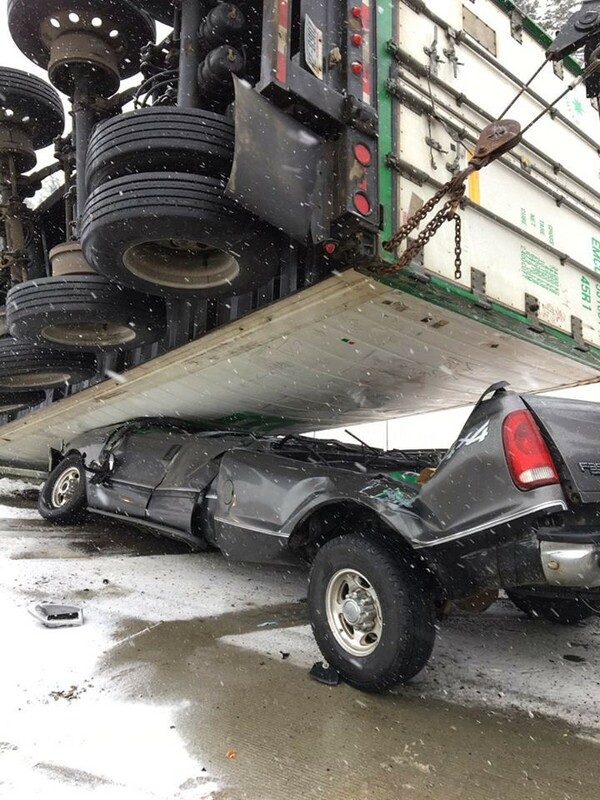 If you have been involved in a trucking accident, contact Davis Law Group.